I’m trying hard, within the confines of what Blog-dom will let me do, to make sure that you really do want to read this! All of the Red puzzles have been sold and as far as I know, there are no plans to produce any more of them. (A recent batch of 25 Extremes pitched up on Puzzlemaster and they sold out VERY QUICKLY after someone on the Revomaze forum pointed out to their fellow puzzlers that some had popped up.) With the exception of that last batch, most Red owners will have had them for quite some time. Given all that, this post is going to be a lot more explicit than any of my other posts … last chance to stop reading if you don’t want the magic savagely ripped from this puzzle! The Red Obsession was launched before the Red Extreme, which was odd to start with … Chris made it clear form the off that this puzzle was not part of any series, it stood on it’s own and it would challenge any puzzlers very seriously. He also made it clear that all of the usual (Revo-)rules didn’t apply to this puzzle. During that time, my Red Obsession gets damaged – the rainbow paths are particularly thin on one side and they duly break, so from inside the trap I can ‘see’ that one of the walls is now missing (and sometime you can feel some errant plastic getting on the way of the pin). I know I’ve broken the maze, there won’t be any more made, so I drill the pin out (disqualifying myself from the Obsession puzzle competition in the process)… and comparing the cores (Obsession v. Extreme) there’s an interesting observation: the little ledge on the Extreme, doesn’t exist on the Obsession. Eh? This might be a good time to introduce some of the stories about the Red … the first one goes that Chris has seen a lot of silly people do some very silly things to their puzzles in order to “solve” them – some of those things make my drilling a pin out of a dead puzzle look pretty amateur! Lump hammers and barbells have been used to literally drive a core straight out of the sleeve. [I’ve seen a Blue core that has a new highway from the start to the finish in a nice neat straight line – they’d even Dremel’d the sides to neaten them up – then returned it to Chris saying their puzzle was ‘broken’.] So having seen this sort of behaviour, he decided to create a puzzle that could only be ‘solved’ by cheating…so if you claim a solve, he knows you’ve cheated – that would certainly fit with what I saw in my Red Obsession. There’s a third story that says the solution to the Obsession involved wearing a ledge yourself, in the right place, without having any clues as to why you’d do that or where you were trying to get to. (FWIW that would take considerable force and plenty of wearing things backwards and forwards – the pin’s got a rounded end, remember – and if you apply anything approaching that level of force in the wrong place, you obliterate several walls in one go!) – I don’t buy this one…but that’s just my opinion. Having said all of that, there are one or two people who claim to have solved a Red Obsession ‘legally’ – I am not one of them. Knowing the solution, you can open a Red Extreme in seconds, literally – even if you aren’t the fastest draw in the west … but telling anyone that who’s still trying to solve theirs effectively short-circuits many, many hours worth of painful exploration… and puzzlers don’t do that to puzzlers, unless they beg! At the end of the day, the Red Extreme looks nice among the other Extremes. Puzzle-wise, it’s unusual given the extent of the redness of that particular brand of fish, and as an in-joke among the Revo-faithful, I think it was fun – it certainly kept a lot of folks who hadn’t engaged their brains properly entertained (if that’s the right word!) 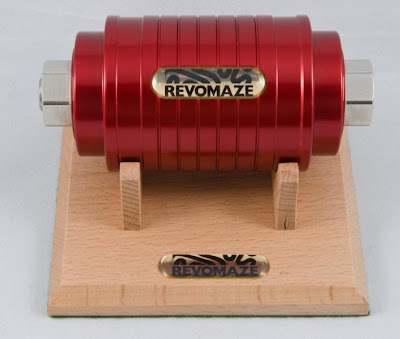 for many months… but setting it free on an unsuspecting public was probably cruel – it was available to anyone who wanted one, and a lot of folks bought one of them as their first, and possibly only, Revomaze – not sure they’ll be investing in a set of Extremes any time soon. YMMV, Objects in the mirror may be closer than they appear, Investments can go up as well as down and any other disclaimer you can think of – they’re my opinions.